For the military academy, see Addiscombe Military Seminary. 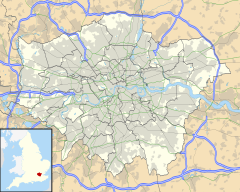 Addiscombe /ˈædɪskəm/ is an area of south London, England, within the London Borough of Croydon. It is located 9.1 miles (15 km) south of Charing Cross and lies within the Historic County of Surrey. Addiscombe is a ward, and had a population of 16,883 in 2011. Addiscombe as a place name is Anglo-Saxon in origin, and means "Eadda or Æddi's estate" from an Anglo-Saxon personal name and the word camp, meaning an enclosed area in Old English. The same Anglo-Saxon land-owner may have given his name to Addington, around two miles to the south. By the thirteenth century, Addiscombe formed part of Croydon Manor, and was known as enclosed land belonging to Eadda. The area was a rural and heavily wooded area, remaining so until the late nineteenth century. Its main industries were farming and brick-making. Clay deposits at Woodside provided the raw materials for the latter. During the Tudor period, Addiscombe was a large country estate a mile from Croydon owned by the Heron family. Sir Nicholas Heron, who died in 1586, is interred in Croydon Parish Church. The estate passed through several owners until 1650 when it was sold to Sir Purbeck Temple, a member of the Privy Council in the time of Charles II. After the death of Sir Purbeck in 1695 and his wife Dame Sarah Temple in 1700, the estate passed to Dame Sarah's nephew, William Draper, who was married to the daughter of the famous diarist, John Evelyn. When Draper died in 1718, he left his estate to his son of the same name and it then passed to his nephew, Charles Clark. In 1702, Addiscombe Place was built to Sir John Vanbrugh's design. He is best known for Blenheim Palace and Castle Howard and was a prime exponent of the English Baroque style. The house was built on a site which is now the corner of Outram Road and Mulberry Lane. It became known as one of three great houses in Addiscombe, the others being 'Ashburton House' and 'Stroud Green House'. It replaced the fine Elizabethan mansion built by Thomas Heron in 1516. John Evelyn recorded in his Diary, "I went to Adscomb on 11 July 1703 to see my son-in-law’s new house. It has excellent brickwork and Portland stone features, that I pronounced it good solid architecture, and one of the very best gentlemen's houses in Surrey." Distinguished guests who stayed at the mansion include George III, William Pitt and Peter the Great of Russia. Peter the Great was reputed to have planted a cedar tree in Mulberry Lane to record his visit. During the eighteenth century Addiscombe Place was successively the home to The Lord Talbot, The Lord Grantham and lastly The Earl of Liverpool, who died there in 1808. In 1809, Emelius Ratcliffe sold the Addiscombe Place to the British East India Company for £15,500, whereupon it became a military academy known as the Addiscombe Military Seminary. The company dealt in the importation of tea, coffee, silk, cotton, and spices, and maintained its own private army. The officers of this army were trained at Addiscombe before setting off for India. After the Indian Mutiny of 1857 the British Government took over control of British India and amalgamated the forces of the Company with the Presidency armies. 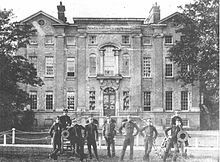 The military seminary was closed in 1861 and the remaining cadets transferred to the Royal Military College, Sandhurst. In 1863, the seminary buildings were sold for £33,600 to developers who razed most of them to the ground. All that survives today are two buildings called 'Ashleigh' and 'India' on the corner of Clyde Road and Addiscombe Road and a former gymnasium on Havelock Road, now private apartments. Five parallel roads were laid out, to the south of the former college site – Outram, Havelock, Elgin, Clyde and Canning Roads. They were all named after individuals who were prominent in either the military or civil governance of British India namely; Sir James Outram, Bt, Sir Henry Havelock, The Earl of Elgin, The Lord Clyde and The Earl Canning. With the advent of the railways in the 1830s, Cherry Orchard Road linking Addiscombe with Croydon ceased to be a quiet rural lane and railway workers' cottages sprang up, many with the still-visible date of 1838. However it was not until 1858 and the sale of the college, that significant urbanisation occurred. There was formerly a small chapel attached to Addiscombe Military Seminary and to this, cadets paraded each morning and evening for a service conducted by the chaplain. On Sundays, cadets went down to the Parish Church in Croydon. By 1827, it became clear that Croydon Parish Church was too far away to minister to the college needs and St James' Parish Church was built and consecrated on 31 January 1829. The population of Addiscombe at this time was about 1000. In 1870, the church of St Paul's (built by Edward Buckton Lamb) was opened and then rededicated in 1874 to St Mary Magdalene. The parish of Addiscombe was formed in 1879. In the 1890s, the Ashburton Estate was gradually sold for redevelopment, and Ashburton House which had previously hosted literary figures such as Alfred, Lord Tennyson, Thomas Carlyle and Henry Wadsworth Longfellow was demolished in 1910. Addiscombe railway station closed in the late 1990s and was replaced by housing. Since early 2006 several parts of Addiscombe have been in the process of extensive regeneration, notably the addition of housing to the site of the former Black Horse Pub and the demolition of former Church Halls and a small garden centre in Bingham Road allowing a new Church Hall and community complex to be built and provide luxury retirement apartments on adjoining land. The old Bingham Road railway station along with two low height railway bridges have been demolished, making way for a new tramlink line with Addiscombe Tram Stop. The former rail station featured in the opening scenes of the 1960 Tony Hancock film "The Rebel". Frederick George Creed (1871-1957), electrical engineer and an inventor of the teleprinter, who lived at 20 Outram Road and is commemorated by an English Heritage Blue Plaque. R. F. Delderfield (1912–1972), writer & dramatist lived at 22 Ashburton Avenue, Addiscombe from 1918 to 1923. His "Avenue" series is based on his life in Addiscombe & Shirley Park, and many of his works were adapted for television. D. H. Lawrence (1885–1930), author, lived at 12 Colworth Road, Addiscombe from 1908 to 1912 and was a teacher at Davidson Road School for some time. Kate Moss was born in Addiscombe. Paul Nihill was Addiscombe and Croydon's first-ever Olympic medallist. In 1964 he won a silver medal in Tokyo for the 50 km walk. Addiscombe railway station - about 500 metres west of Addiscombe's main parade and the present tram station - was demolished following the withdrawal of services from Elmers End. Part of the section between Woodside and Addiscombe railway stations is now Addiscombe Railway Park and part, the former Station area, has been redeveloped for housing as East India Way. ^ Mills, A.D. (2010). A Dictionary of London Place-Names. Oxford University Press. p. 3. ISBN 9780199566785. ^ "H.O.M.E Residents Association" (PDF). H.O.M.E Residents Association. ^ "Exploring Surrey's Past". exploringsurreyspast.org.uk.